WASHINGTON, D.C. (Jan. 31, 2013) – At the Washington Auto Show today, Nissan outlined its strategy for tripling the current electric vehicle quick-charging infrastructure in the United States with the addition of at least 500 quick-charging stations in the next 18 months, including the greater Washington D.C. area’s first fast-charge network. Nissan and its charging infrastructure partners estimate that about 160 fast chargers are currently available for public use across the United States, and no fast chargers are available for public use in Washington D.C. Most electric vehicle (EV) drivers now rely on home charging, and having additional charging options can significantly increase their rate of EV driving. Nissan’s strategy is focused on a three-prong approach to increase the number of available fast chargers though its dealer network, workplace campus charging and opportunities within local neighborhoods that help interconnect communities where drivers spend the bulk of their time and do the majority of their driving. Nissan is working with its dealers, local municipalities and infrastructure partners that include NRG Energy and its eVgo® Network to increase the current number of public charging options. A key part of this infrastructure enhancement is eVgo’s new greater Washington, D.C. ecosystem, which will include a network of 40 eVgo Freedom Station ® sites across the area. Each Freedom Station site will have a Nissan fast charger that can provide EVs such as the Nissan LEAF with up to an 80 percent charge in less than 30 minutes. NRG’s new greater Washington, D.C. network will be the first such network of fast chargers in the northeastern United States. NRG currently operates similar networks in Houston and the Dallas/Fort Worth Metroplex and has announced networks in the San Francisco, Los Angeles, San Diego and San Joaquin Valley areas. Through its subsidiary eVgo, NRG’s investment of approximately $150 million in EV charging infrastructure will provide EV drivers with access to hundreds of public fast-charging Freedom Station sites along with level 2 (240-volt) charging stations at homes, offices, multi-family communities, schools and hospitals across Texas, California and the greater Washington, D.C. metropolitan area. eVgo provides charging solutions directly to EV owners as well as businesses looking to serve the EV charging needs of their residents, tenants, employees or customers. Service plans offered by eVgo enable EV owners to avoid paying large up-front costs for a charger and provide unlimited charging at Freedom Station sites for a monthly fee. In North America, Nissan’s operations include automotive styling, engineering, consumer and corporate financing, sales and marketing, distribution and manufacturing. Nissan is dedicated to improving the environment under the Nissan Green Program and has been recognized as an ENERGY STAR® Partner of the Year in 2010, 2011, and 2012 by the U.S. Environmental Protection Agency. More information on Nissan in North America and the complete line of Nissan and Infiniti vehicles can be found online at www.NissanUSA.com and www.InfinitiUSA.com, or visit the Americas media sites NissanNews.com and InfinitiNews.com. NRG Energy, Inc., is at the forefront of changing how people think about and use energy. A Fortune 300 company based in Princeton, NJ, NRG is a pioneer in developing cleaner and smarter energy choices for our customers: whether as one of the largest solar power developers in the country, or by building the first privately funded electric vehicle charging infrastructure or by giving customers the latest smart energy solutions to better manage their energy use. Our diverse power generating facilities can support more than 20 million homes and our retail electricity providers-Reliant, Green Mountain Energy Company and Energy Plus-serve more than two million customers. More information is available at www.nrgenergy.com. Connect with NRG Energy on Facebook and follow us on Twitter @nrgenergy. NRG Energy, through its eVgo ® Network is creating the nation’s first privately funded, comprehensive electric vehicle ecosystem. The eVgonetwork gives EV owners new freedom and range confidence via home charging and fast charging stations conveniently located at major retailers, employers as well as along highways across eVgo cities. Service plans offered by eVgo allow EV owners to avoid paying large up-front costs for a home charger and provide unlimited use of the eVgo network of Freedom Station® sites -all for one low monthly fee. To find out more, or to join the eVgo network, visit www.eVgoNetwork.com. 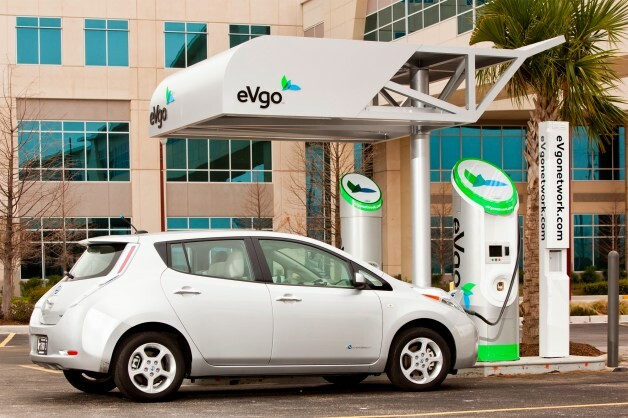 Connect with eVgo on Facebook and follow us on Twitter @evgonetwork. This news release contains forward-looking statements within the meaning of Section 27A of the Securities Act of 1933 and Section 21E of the Securities Exchange Act of 1934. Such forward-looking statements are subject to certain risks, uncertainties and assumptions and include NRG’s expectations regarding the timing of its deployment of electric vehicle infrastructure in the Washington, D.C., metropolitan area and forward-looking statements typically can be identified by the use of words such as “will,” “expect,” “believe,” and similar terms. Although NRG believes that its expectations are reasonable, it can give no assurance that these expectations will prove to have been correct, and actual results may vary materially. Factors that could cause actual results to differ materially from those contemplated above include, among others, general economic conditions, hazards customary in the power industry, competition in wholesale power markets, the volatility of energy and fuel prices, failure of customers to perform under contracts, changes in the wholesale power markets, changes in government regulation of markets and of environmental emissions, and our ability to achieve the expected benefits and timing of our electric vehicle projects. NRG undertakes no obligation to update or revise any forward-looking statements, whether as a result of new information, future events or otherwise. The foregoing review of factors that could cause NRG’s actual results to differ materially from those contemplated in the forward-looking statements included in this news release should be considered in connection with information regarding risks and uncertainties that may affect NRG’s future results included in NRG’s filings with the Securities and Exchange Commission at www.sec.gov.